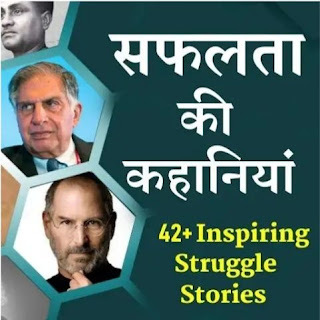 Hello friends,If you want to achieve big success in your life then you should have need to motivate at every seconds of life,You must need to read some most inspiring success stories of the world,because they successful person can guide you right way to achieve your goal from their success. 40+ inspiring real life success stories to motivate you. 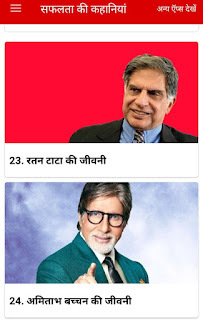 This app is in easy Hindi Language. Simple app. Works offline. You don't need any internet connection to access this app. Professionally designed, user-friendly and intuitive interface. Clear Hindi font for better readability. You can share any story to the social sites Whatsapp, facebook, instagram and other sites. This app belongs to the world most successful people of the world like Swami Vivekanand,Amitabh bacchan ,Bill Gates and many others.In this app all stories only for educational purpose,Daily motivation,Inspires for many others people w\ho want to do big in his life.Very nice app and you must try it once and change your lifes attitude by reading these successful stories. 1. This app is a self-contained offline app with a part of the contents from public domain. 2. The purpose of app is to provide entertainment/general information to user. All the images/audio and text contained in the app are collected from different internet sources. All the images/audio are readily available in various places on the internet and are believed to be in the public domain. However, we do not claim ownership/copyright of material/media used in the app. We acknowledge that the respective copyright owners of the contents own the rights. If you own the right to any content in the app, please write to us at todaydealsoffers@gmail.com with the copyright details of the original source, and the stated content will be removed immediately. No infringement intended. If you want to download pleaseClick on download button given below.